Austria stamps issued between 1951 and 1953 continued the trend of being primarily commemorative stamps and pictorial charity stamps. The number of stamps issued began to be more conservative in volume, and the long-sets of previous years were being replaced by individual postage stamp issues. During the early 1950's, the World economy was slowing down a bit, and some of the stamps issued during this period, unfortunately, have become a bit pricey. It appears that there are a LOT of stamps shown on this page, and there are, but when one considers that these stamps were all issued over a period of three years, there were not very many of them issued per year at all. 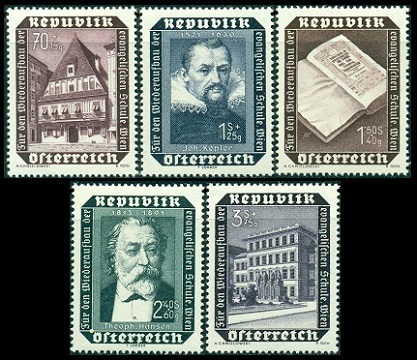 The four surtaxed pictorial Austria stamps shown above (Mi. #960-63, Sc. #B273-76) were issued on March 10, 1951 to publicize and to fund ongoing Austrian post-war reconstruction efforts. 40 G. + 10 G. - Miner. 60 G. + 15 G. - Mason. 1.00 S. + 25 G. - Bridge builder. 1.70 S. + 40 G. - Electrician. The 60 G. denomination stamp shown above, at the left (Mi. #964, Sc. #574), was issued on April 12, 1951 to commemorate the 150th Anniversary of the Birth of the Austrian composer Joseph Lanner (1801-1843). The 15 G. denomination stamp shown above, at the right (Mi. #965, Sc. #575), was issued on June 28, 1951 to commemorate the 150th Anniversary of the Death of the Austrian painter Martin Johann Schmidt (1718-1801). The 1.50 S. denomination stamp shown above, at the left (Mi. #967, Sc. #578), was issued on October 10, 1951 to commemorate the 10th Anniversary of the Death of the Austrian operatic composer Wilhelm Kienzl (1857-1941). The 1.50 S. denomination stamp shown above, at the right (Mi. #970, Sc. #579), was issued on March 3, 1952 to commemorate the 100th Anniversary of the Birth of the Austrian composer and musician Josef Schrammel (1852-1895). The 1 S. denomination stamp shown above, at the left (Mi. #971, Sc. #577), was issued on March 1, 1952 to commemorate the 150th Anniversary of the Birth of the Austrian engineer and inventor Karl Ritter von Ghega (1802-1860). The 1.50 S. + 35 G. denomination stamp shown above, at the right (Mi. #972, Sc. #B278), was issued on March 10, 1952 for Stamp Day. The surtax benefited the Stamp Day celebrations. The design depicts Cupid as a Postman. The 1.50 S. denomination stamp shown above, at the left (Mi. #974, Sc. #581), was issued on July 1, 1952 to publicize the formation of the International Union of Socialist Youth Camp at Vienna. The 1 S. denomination stamp shown above, at the right (Mi. #975, Sc. #582), was issued on August 13, 1952 to commemorate the 150th Anniversary of the Birth of the Austrian poet Nikolaus Lenau (1802-1850). The 2.40 S. denomination pictorial stamp shown above, at the left (Mi. #976, Sc. #583), was issued on September 6, 1952 to promote International Letter Writing between Austrian and foreign school children. The 1.50 S. denomination stamp shown above, at the right (Mi. #981, Sc. #587), was issued on February 21, 1953 to commemorate the 50th Anniversary of the Death of the Austrian composer Hugo Wolf (1860-1903). The 1.50 S. denomination stamp shown above, at the left (Mi. #982, Sc. #588), was issued on April 24, 1953 to celebrate the 80th Birthday of President Theodor Körner. The 1 S. denomination stamp shown above, at the right (Mi. #994, Sc. #590), was issued on November 30, 1953 to celebrate Christmas. The design depicts a child admiring a Christmas Tree. 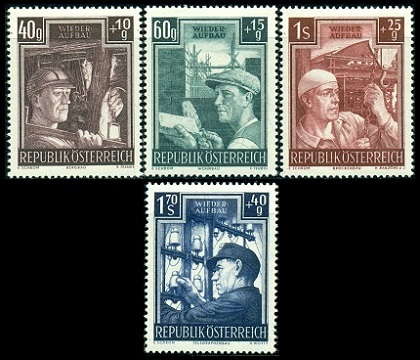 The five surtaxed pictorial Austria stamps shown above (Mi. #989-93, Sc. #B281-85) were issued on November 5, 1953 to benefit the reconstruction of the Lutheran School in Vienna. 70 G. + 15 G. - Bummerhaus, Styria. 1.00 S. + 25 G. - Johannes Kepler (1571-1630), astronomer and mathematician. 1.50 S. + 40 G. - First Edition of the Lutheran Bible (1534) in the National Library of Austria. 2.40 S. + 60 G. - Theophil von Hansen (1813-1891), architect. 3.00 S. + 75 G. - Lutheran School in Vienna, after reconstruction. The 1 S. + 25 G. denomination stamp shown above (Mi. #995, Sc. #B286) was issued on December 5, 1953 for Stamp Day. The surtax benefited the Stamp Day celebrations. The design depicts a stamp album, magnifying glass and World globe. The 1 S. denomination commemorative stamp shown above (Mi. #959, Sc. #573) was issued on March 3, 1951 in memory of Karl Renner (1870-1950). The stamp shown above (Mi. #966, Sc. #576) was issued on August 3, 1951 for the 7th World Scout Jamboree near Bad Ischl, Austria, August 3 through August 13, 1951. The 2.40 S. + 60 G. denomination stamp shown above (Mi. #969, Sc. #B277) was issued on January 26, 1952 to publicize the 1952 Olympic Games, held in Oslo, Norway and Helsinki, Finland. The surtax benefited the Austrian Olympic Team. The design features a laurel branch (symbolizing peace) and the Olympic Rings. The 1.50 S. denomination stamp shown above (Mi. #973, Sc. #580) was issued on May 24, 1952 to celebrate the 200th Anniversary of the Vienna Zoological Gardens. The design features the Breakfast Pavilion at Schönbrunn Palace. The 1 S. + 25 G. denomination stamp shown above (Mi. #977, Sc. #B279) was issued on September 6, 1952 to publicize the Austrian Catholic Convention, held in Vienna during September. The design features the sculpture "Christ, the Almighty" from the pediment above the main door of St. Stephan's Cathedral. The overprinted and surtaxed stamp shown above (Mi. #983, Sc. #B280) was issued August 29, 1953 to celebrate the 60th Anniversary of Labor Unions in Austria. The 1.50 S. denomination stamp shown above (Mi. #988, Sc. #589) was issued on October 17, 1953 to celebrate the 150th Anniversary of the State Theater in Linz, Upper Austria.